Handmade by Mother: Peter Pumpkin Eater! I couldn’t resist another Crochet World pattern. Their fall magazines are a veritable treasure trove of Halloweeny Goodness. 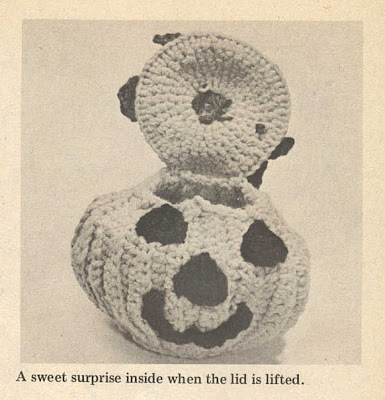 Just like this crocheted pumpkin is designed to be a vegetable treasure trove. What’s that you say? Pumpkins are fruit? Bah! If the U.S. Supreme Court can rule that tomatoes are vegetables then by the power vested in me by the Great Pumpkin, I can make bad veggie puns about pumpkins. Oh yes, the Great Pumpkin is a close, personal friend of mine. We went to the same frat. And for dessert -- chilled pumpkin brains! MATERIALS: Knitting worsted weight yarn 2 oz. orange small amounts of green and black; crochet hooks sizes O and F; polyester fiberfill for stuffing (optional). FINISHED SIZE: Approximately 7’’ high. NOTE: Pumpkin head is made in four sections. For best results, do not work sl sts too tightly. HEAD: With size F hook and orange, ch 23. ROW 1: Sl st in 2nd ch from hook and in each of next 2 ch, sc in each of next 3 ch, hdc in each of next 3 ch, dc in each of next 4 ch, hdc in each of next 3 ch, sc in each of next 6 ch, ch 1, turn (22 sts). From here on work in back lps only across rows. ROW 2: Work sc in each sc, hdc in each hdc, dc in each dc, hdc in each hdc, sc in each sc, sl st in each sl st, ch 1, turn. ROW 3: Work a sl st in each sl st, sc in each sc, hdc in each hdc, dc in each dc, hdc in each hdc, sc in each sc, ch 1, turn. Repeat rows 2 and 3 until longer edge (the one with the 6 sc) measures 2 3/4’’ wide. End off leaving long strand for sewing. Make 3 more of these sections. Sew the 4 sections together matching stitch for stitch and having the wider ends form the top and the narrow ends form the bottom. Work 1 rnd sl st around top opening with orange. What? 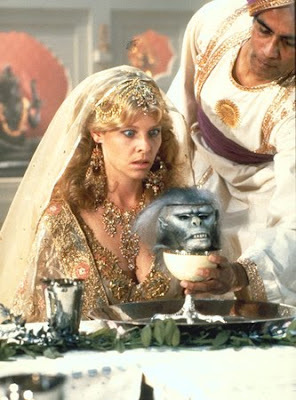 You’re telling me that the picture above didn’t immediately remind you of Indiana Jones and the Temple of Doom? BOTTOM: With orange, ch 2. RND 1: 6 sc in 2nd ch from hook. RND 2: 2 sc in each sc around (12 sc). RND 3: Sc in each sc around. End off. Sew this piece to bottom opening of pumpkin head. TOP: With orange, ch 2. RNDS 1 & 2: Work rnds 1 and 2 of bottom (12 sc). RND 3: Repeat rnd 2 of bottom once (24 sc). RND 4: Work even in sc. RND 5: Work * sc in next sc, 2 sc in next sc, repeat from * around (36 sc). RNDS 6 & 7: Work even in sc. RND 8: Work 2 sc in each sc around (72 sc). RND 9: Sl st in each st around. End off. And speaking of pumpkin brains, I’ve discovered the perfect dinner to serve my family on Halloween. 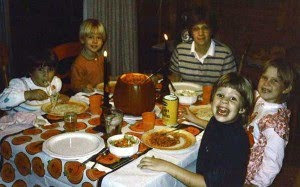 Judging from the clothing and haircuts on these kids, this recipe might also date back to the 1980s. LEAVES: (make 3.) With green and size O hook, ch 2. ROW 1: Work sc in 2nd ch from hook, ch 1, turn. ROW 2: Work 2 sc in sc, ch 1, turn (2 sc). ROW 3: Work 2 sc in each of 2 sc, ch 1, turn (4 sc). ROW 4: Working in sc, 2 sc in first and last sc, ch 1, turn (6 sc). ROW 5: Repeat last row once (8 sc). ROW 6: Work 1 row even in sc, ch 1, turn. ROW 7: Working in sc, * pull up a lp in each of next 2 sc, yo and through all lps on hook – 1 dec made, repeat from * across, ch 1, turn (4 sc). Repeat last row until only 1 st is left. End off leaving long strand for sewing. Size O for the leaves? A 12 mm hook seems like an unusual choice for worsted weight yarn. It’s either a different hook sizing system than I’m used to or the leaves are supposed to be very... erm, lacy. Oh, look! The tendrils and stems use size O too. Well, as the Great Ralph Waldo Emerson used to say, consistency is the hobgoblin of little pumpkins. TENDRILS: With green and size O hook, make chains of varying lengths (model shows 4 tendrils) work 2 sl st in 2nd ch from hook and in each ch across. End off leaving long strand for sewing. Repeat for each tendril. STEM: With green and size O hook, ch 10, sc in 10th ch from hook to form ring. RND 1: Sc in each st around. Repeat this rnd until 7 rnds have been completed. End off leaving long strand for sewing. Sew stem to center of top piece. Sew leaves and tendrils in place around stem as shown. 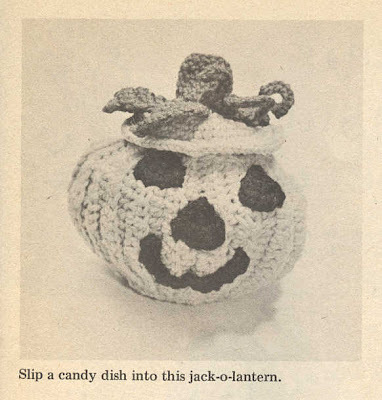 If Jack-O-Lantern is to be stuffed, sew top piece on all the way around stuffing before opening becomes too small; if it is to be filled with candy, sew top piece to top opening with a few stitches at center back so the top will open and close like a lid. But why would you want to sew the top piece shut and lock away all the tasty goodness inside? EYES & NOSE: With black and size F hook, ch 2. ROW 1: Work 2 sc in 2nd ch from hook, ch 1, turn. ROW 2: Work 2 sc in each sc across, ch 1, turn (4 sc). ROW 3: Work even in sc, ch 1, turn. ROW 4: Work sc in first sc, 2 sc in each of next 2 sc, sc in last sc (6 sc). Continuing along one angled side, sl st in each st working 2 sl st in last st and working sl st along other angled side. End off leaving long strand for sewing. Repeat for other eye and for nose. Sew in place to front of pumpkin. MOUTH: With black and size F hook, ch 21. ROW 1: Sc in 2nd ch from hook, ch 1, sl st in same st as sc, * sk next ch, sc in next ch, ch 1, sl st in same st as last sc, repeat from * across. End off leaving long strand for sewing. Sew in place to front of pumpkin. Uh oh. Friends of the cannibalized pumpkin have come for revenge. 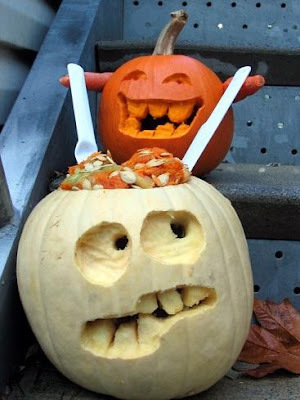 I told you pumpkins were honorary vegetables! Click here for the printable pattern. This blog is the result of a near OCD compulsion to transcribe - and mock! - vintage patterns, ads, and other odds and sods. And you, dear reader, are the fortunate beneficiary. Every month you will discover new patterns from the past century. These are the vintage gems that generations of women have inflicted upon husbands, children and themselves. You are cordially invited to recreate these products of subconscious hostility and not-so-passive aggression. Send photos of the results to victoriadunnwrites (at) hotmail (dot) com, and I will be delighted to mock them for you. DIY - "I'm melting! Melting! Oh, what a world!" DIY - Jack o'Lantern Doorknob Cozy! Pumpkins, Witches and Skeletons, Oh My! What do you mean, she looks like a pumpkin? Knit or Crochet, Ripple Socks Make Their Own Fun! DIY - Smile! It's World Smile Day! Victoria Dunn is a mystery wrapped in a knitting pattern.